Exactly a year ago today, my younger brother married his best friend/partner for life. 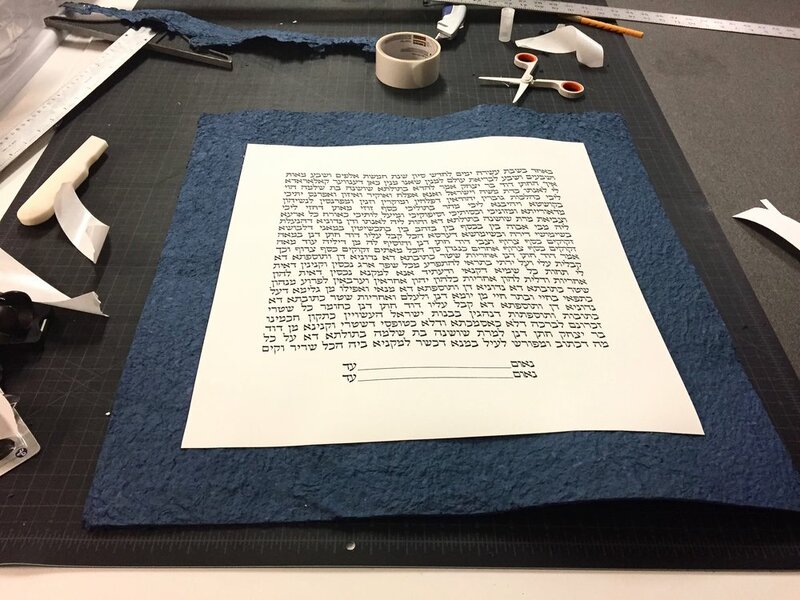 Dave and Shoshi gave me the honorable task of creating the backdrop of their ketubah, the Jewish marriage contract that outlines the rights and responsibilities of the bride and groom. I am no doubt a creative, artistic person, but at the time I was in the groove of designing social justice-based art projects with teens and producing bubble prints with kiddos. Needless to say, this was a daunting task. I had absolutely no idea where to begin. All I knew is I wanted this process to be meaningful, relevant and personalized. I also knew I wanted more than just my craftsmanship involved in this process. An enthusiast for paper arts, I thought: keeping to their navy & white color palate and aesthetic, what if I made a large piece of paper comprised of notes from all of Shoshi & Dave’s closest family and friends? It would mean actually shredding the notes received to form a brand new paper pulp, but the concept was that these messages would be mixed and blended together to form a foundation grounded in love, sentiment, & support. Though I had made paper from scratch before, creating one giant piece of paper was a first. This entailed building my own deckle, which is a frame to mold the paper…which I totally can’t take any credit for. My fiancé, Will, did that part (#teamwork). I think one of my favorite parts in this process was the use of non-traditional art tools such as a baby pool, food blender, rolling pin and bath towels (see details below). First, I reached out to Dave & Shoshi’s family members and friends in the wedding party to share a note of good wishes on this blue paper. Once I gathered all the good wishes, I typed them up for posterity (and later to share with Dave & Shosh)…and then proceeded to cut them up. I then took that chop a step further and blended the notes together in an actual food blender. This what formed the paper pulp. In the meantime, Will built a deckle using wood + a screen from San Lorenzo Lumber. Next it was time to bust out the baby pool. The day was hot in Santa Cruz, so it was actually really perfect. 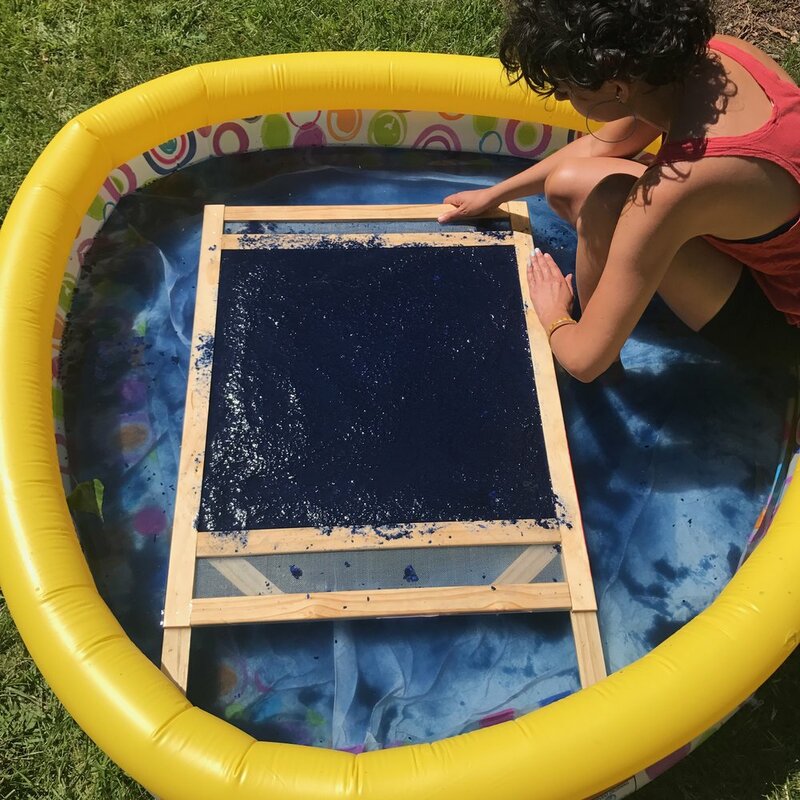 We filled the pool with water, set down the deckle, and began to pour the paper pulp onto the deckle. After a little shake back & forth a few times, the sheet started to form. Thereafter, using my hands, I began to smooth it over. We then laid down a towel and wax paper, flipped the deckle over and waited for the sheet to dry. …And then we let nature do it’s thing and waited it for dry. It took a good 48 hours for it to completely dry outside in my backyard. We might have found a few paw prints on there (kidding…maybe). And then it was ready to ship to Denver, Colorado! 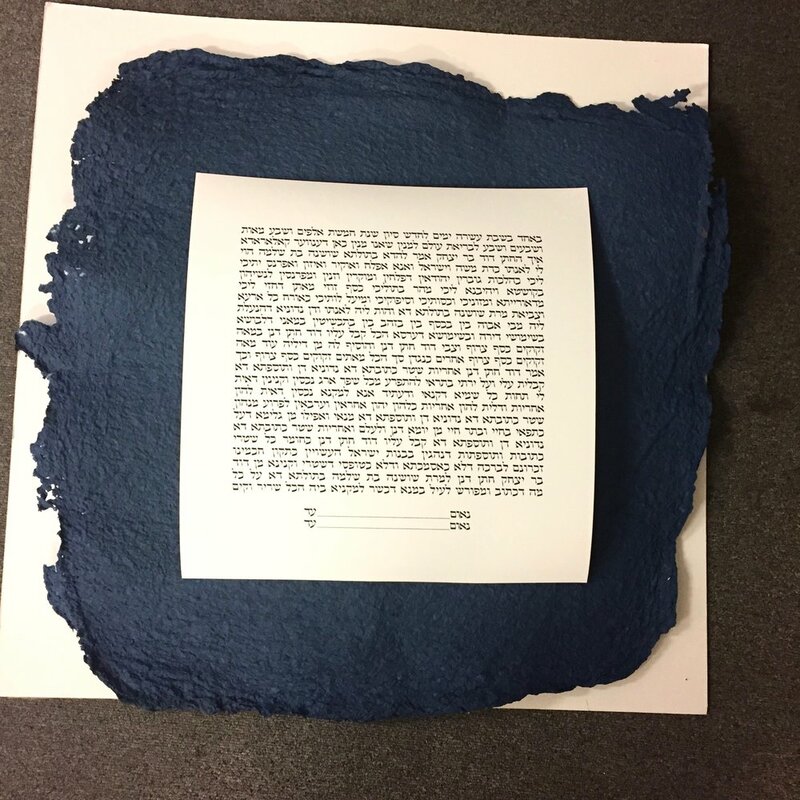 In a traditional Jewish wedding, the ketubah is a very centralized focal point. Prior to the ceremony, it’s signed by two witnesses, blessed by a Rabbi, read aloud by the Rabbi during the ceremony, whereafter the bride raises it for all to see. It hit me during this particular moment, that this ketubah wasn’t just something that will live on a wall in Shoshi & Dave’s home. It’s was an integral part of the entire wedding day, and I remain incredibly honored that Shoshi and Dave entrusted me to create such an important element of their nuptials.